The ticket for the Pinoy Pride 37: Pagara vs Juarez is now available and can purchase online. The Pinoy Pride 37 is a boxing event that will be held at San Mateo Event Center, San Mateo, California on July 9, 2016. 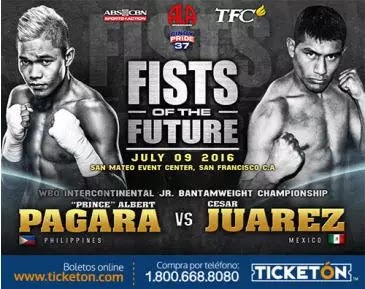 Featuring the top prospect from the Philippines Albert Pagara vs the tough Mexican boxer Cesar Juarez. This event is brought to you by ALA Promotions and ABS-CBN Sports and Action.